This document is designed to show you how to carry out a consultation with your client via Telehealth. You can use this function without the need to assign exercises or other content to your client. 1. 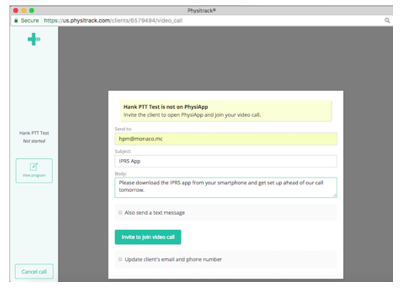 In Physitrack, go to “ Clients” tab at the bottom of the screen and search for your client. 2. Open your clients file and press the “ Start video call” button. 3. You will be prompted to send your client a message, containing the details of the call. Change the title of the message by clicking in the “ Subject” box. 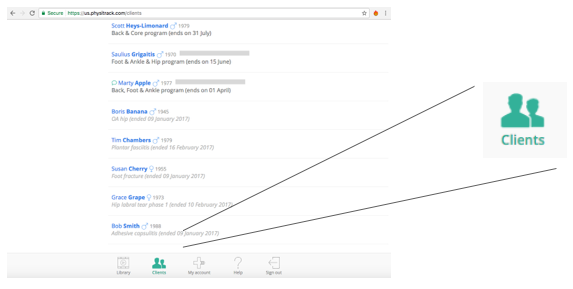 Modify the content of the message by clicking in the “Body” box. Click “Invite to join video call” to send message. 4. End the call by pressing “ Cancel call” button. 5. Your client meanwhile will receive an email with their 6 letter access code, prompting them to download the app, and login using the code. 6. When your client is online, a “Call” button will appear beside your clients name in the main client list view. 7. Start the call by pressing the “Call” button. Ensure you select to “Turn on your camera and microphone”. 8. Commence your call with your client via encrypted audio and video.